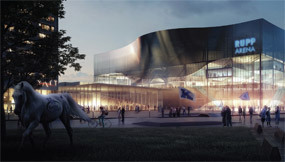 Exterior elevation rendering of the proposed renovation of Lexington’s Rupp Arena that was approved by the Rupp Arena Arts and Entertainment Task Force. The design was created by SPACE GROUP, an architectural and design firm based in Norway. Kentucky business leaders and public sector officials who play key roles in economic development have a discernibly rosier outlook for economic prospects in 2012 than they did a year ago. Among the several dozen leaders who shared their views for this new year, the composite view is that the economy is, indeed, gaining and sustaining positive momentum. It’s not robust, but it is on the upswing. 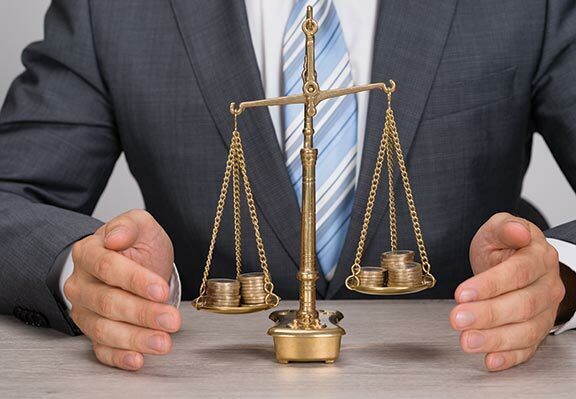 We likely are still a couple of years from what most business people would consider substantial recovery from the 2008 financial crisis and recession, whose impact created the worst conditions since the Great Recession of the 1930s. But there are encouraging green shoots sprouting in much of the Bluegrass State. Topping the list, of course, is Ford Motor Co.’s decision to invest $1.2 billion in its two assembly plants in Louisville. 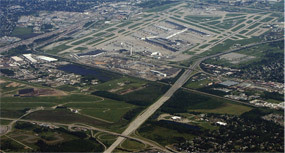 That project, in fact, was voted the top deal in the United States in 2011 by Business Facilities magazine. The now-completed makeover of Louisville Assembly Plant into what Ford terms the most advanced and flexible vehicle manufacturing site in the world already has brought two new work shifts and 3,000-plus jobs. The renovators show up at Ford’s Kentucky Truck Plant next. Louisville International Airport expects continued restructuring in the passenger service industry and that the nearby UPS Worldport hub will keep it one of the busiest cargo airports in the world. Manufacturing in general is coming back strongly, which is giving Kentucky a job-growth rate that is better than the national average. 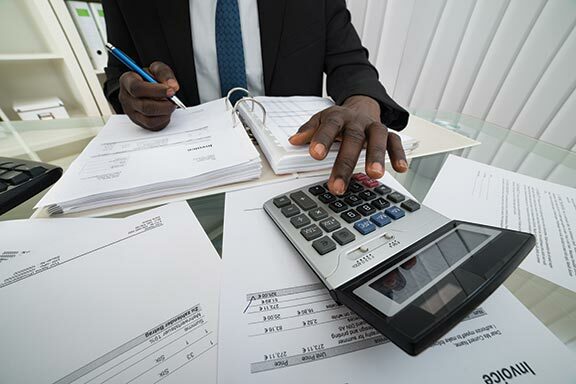 That sector could be significantly stronger, however, if federal government decision makers could eliminate policy uncertainty about tax rates and healthcare insurance regulations, which would allow businesses to develop reliable five-year plans. Another cloud hovering on the scene for Kentucky business is new regulation by the Environmental Protection Agency for coal-fired power plants. Meeting emission standards means increases in the state’s traditionally cheaper coal-based electricity costs, decreasing a business advantage the commonwealth enjoys. As in the rest of the nation, the housing sector remains on its back. 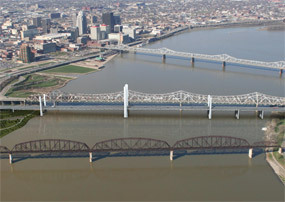 This rendering depicts one of two new Ohio River bridges – shown here across the center of the photo alongside the existing Kennedy Bridge in downtown Louisville – that Kentucky and Indiana officials expect to get construction started on in 2012. The long-sought Ohio River Bridges Project also will include a second structure known as the East End Bridge several miles north of downtown Louisville linking I-265 (Gene Snyder Expressway) with connecting highways in Utita, Ind. 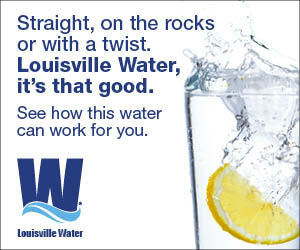 However, leaders in nearly all regions of Kentucky are able to point to economic positives taking place. Agriculture income topped $5 billion in 2011, a record that will be topped in 2012 barring unusually bad weather. Tourism was up 5 percent statewide in 2011 and that sector foresees further growth this year. In addition to Ford’s investment, Louisville expects the multibillion-dollar Ohio River Bridges Project to begin this year. Its important healthcare sector is growing. Major construction projects in Owensboro that continue this year already have pushed its unemployment rate down, and Bowling Green is seeing benefits from its major downtown renovations of the past few years. Northern Kentucky is riding higher morale after DHL expanded its cargo shipping hub and NKU opened its glitzy, high-tech Griffin Hall for the College of Informatics. In the Bluegrass region, Toyota will export 6,000 Camrys to Korea this year, and TMMK officials are pleased about the company’s overall plans for higher production and dozens of new model introductions throughout the year. Animal feed supplement maker Alltech has a $1 billion revenue goal for this year, which is double its 2010 figure, and is planning to grow to $4 billion annually within three years. 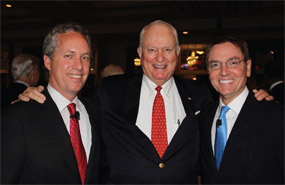 Louisville Mayor Greg Fischer, Jim Host and Lexington Mayor Jim Gray at the kickoff event in Louisville for the Bluegrass Economic Advancement Movement. BEAM will promote advanced manufacturing in the corridor between Greater Louisville and Central Kentucky. Around the state, businesses striving to remain competitive during the past three lean years have been upgrading their technology and operations, and the resulting productivity improvements are showing up in better profitability despite the lackluster U.S. economy. Frankfort officials like what is beginning to happen with Kentucky’s role in foreign trade. They believe the state will again have higher exports in 2012 and note the growing number of foreign investment projects they’ve been able to announce. Kentuckians are a hard-working but cautious lot. They don’t go for gimmicks. There has not been a failure of a state-chartered bank in decades. After keeping their heads down and belts tightened and telling The Lane Report they were “cautiously optimistic” for several years, members of the business community are beginning to indulge in some genuine optimism about 2012. 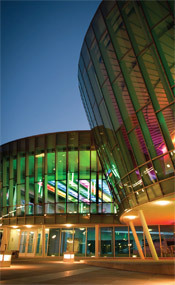 There will be a national effort to recruit informatics companies to Northern Kentucky this year after the 2011 opening of $53 million Griffin Hall at NKU, built specially for the university’s informatics program. – Steve Sigg, CEO SIS Holding Company Inc.
– John J. Leehy III, President & CEO Payment Alliance International Inc.
– Bob Quick, President & CEO Commerce Lexington Inc.
“Specific to commercial construction, we’re seeing modest signs of growth over last year. Fueling this upswing are infrastructure investments in healthcare, higher education and life sciences. Throughout the downturn firms have absorbed material cost increases as a result of intense competition for work. If costs continue to rise, we may see firms unable to continue to do this due to what are already very tight margins. This could result in significant inflation for construction costs. At Messer we continue to see the importance of market differentiation and strong relationships as success indicators in a challenging economic environment.” – Mark Gillming, Senior Vice President, Messer Construction Co.